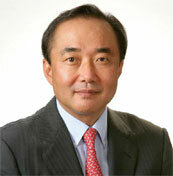 Dr. Charles Cholsoo Lho is founding Chairman & CEO of Amicus Group. He is also founding investor of Quid and YouNoodle and serves on both companies’ board as Chairman. Concurrently, Dr. Lho is publisher of Korea JoongAng Daily, Korea’s leading English newspaper in partnership with the International Herald Tribune. Prior to his current responsibilities, Dr. Lho served in various executive capacities at the Samsung Group Chairman’s Secretariat, Samsung U.S. Representative Office, and Samsung Economic Research Institute (SERI), Korea’s leading private think tank. At SERI, he founded and launched SERI Quarterly, the nation’s leading quarterly journal in economics and business. Other professional experience includes positions as researcher at the World Trade Organization and as marketing manager at Proctor & Gamble Export & Special Operations, both headquartered in Geneva, Switzerland. Dr. Lho pursued all of his education abroad, completing his AB Honor in international relations at Stanford University and MBA in corporate strategy as a Fulbright Scholar at Yale University’s School of Management. His PhD from Oxford University examined the Korean government’s unprecedented $3 billion loan to Moscow and the political and economic foundations upon which Russian-South Korean relations were established. For a more detailed profile, see Charles Cholsoo Lho at LinkedIn.